This blog is co-authored by Wee Hyong Tok, Principal Data Scientist Manager, Office of the CTO AI. In recent years, we have seen a leap in practical AI innovations catalyzed by vast amounts of data, the cloud, innovations in algorithms, hardware, and more. So how do developers begin to design AI applications that engage and delight your customers, optimize operations, empower your employees, and transform products? Using Azure Cognitive Services you can now infuse your applications, websites, and bots with intelligent capabilities. These capabilities build on years of research done on vision, speech, knowledge, search, and language. Using different cognitive services, developers can now easily add AI capabilities without training the machine learning models from scratch. Gain an in-depth understanding of the tools, infrastructure, and services that are available on the Azure AI platform. Get started with developing an Intelligent Chatbot, with plug and play intelligence that enriches your bot to support engaging experiences. Learn about the resources available on AI. 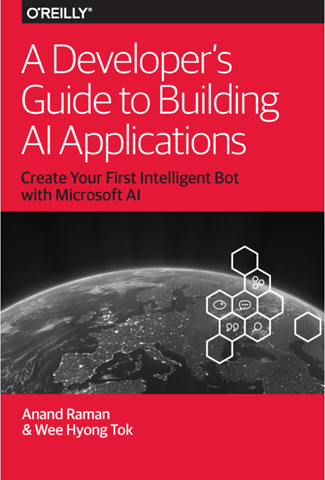 Download A Developer’s Guide to Building AI Applications. Learn more about Azure AI. Try Cognitive Services APIs for free. Watch the Ignite 2018 AI sessions.